It’s not often that a jewellery trend comes along that fits into the “cheap” bracket. Heck, you might even think it sacrilege to utter the words “jewellery” and “cheap” in the same sentence. However the latest trend in ear and arm candy promises not to gobble up half of your pay packet in one swift click. Step forward your new jewellery obsession: resin. Yes, that plastic material last popular in the '70s is back. (Side note: If you haven't already pillaged your mother's jewellery box, get in there stat.) At Balenciaga, the material was crafted into XL aquamarine earrings, while on the front row, it came in the form of tortoiseshell hoops. 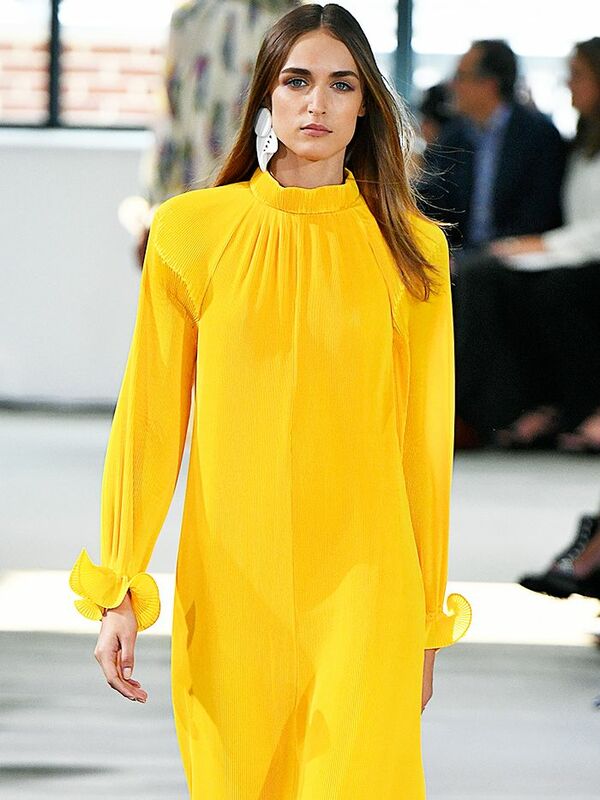 It was here on the front row during London Fashion Week that my own add-to-basket moment happened, when I spotted four blondes across the catwalk, each with said tortoiseshell hoops punched through their ears. After a quick online shop scan on my phone, I bought a pair of sculptural circles from the mini jewellery outfit Silk & Stars—£12, thank you very much. If the thought of adding plastic to your jewellery box requires further convincing, look no further than to the style god Solange Knowles, who recently wore a pair of shapely silver-leaf flecked earrings from the New Zealand jewellery label Mars. Stealth labels like Ellery, Marni and Isabel Marant are all tapping resin for S/S 18 too. Don't just take it from me: Louise Olsen is the co-founder of Dinosaur Designs, an Australian jewellery and interiors label that specialises in the material. "I love the fluidity of resin," she says. "It's a lot like paint." Indeed, what I like about resin—which comes in liquid form and is made into jewellery by hand-pouring it into moulds—is that it feels arty without being OTT; minimal yet eye-catching. Most importantly, though, it doesn't look cheap, even when you get change back from 15 quid. Click through the gallery to shop our favourite bargain resin pieces, from bangles to, yep, tortoiseshell hoops. Make the most of these by pairing with an updo. Match them to your lipstick. Etsy is a real hub for niche jewellery trends. People will ask you about this purchase, we promise. We're a little bit obsessed with Jigsaw rn. A very elegant route in. Your party bangle has arrived. This brand has SO many tortoiseshell options. Place over a navy roll-neck. Excuse us while we leave work and go and buy these. Zara just took it to the next level. We could imagine this adorning one of Alexa Chung's shirts. Your face just became a living work of art. See a pair that's caught your eye? What are you waiting for?